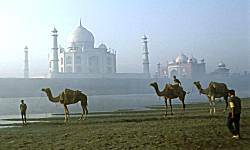 Taj Mahal Tour Package : Taj Mahal in Agra, India is regarded as one of the eight wonders of the world, and some Western historians have noted that its architectural beauty has never been surpassed. Taj Mahal is built entirely of white marble. Its stunning architectural beauty is beyond adequate description, particularly at dawn and sunset. The Taj seems to glow in the light of the full moon. Taj Mahal was built by the Mughal Emperor Shah Jahan, as the mausoleum of his beloved Queen Mumtaz Mahal, after her death in 1631. The Taj Mahal is recognized worldwide as a symbol of eternal love. The Taj Mahal is a UNESCO world Heritage site. Early morning Drive to Agra (by road approx 4 Hrs), reach Agra and visit Taj Mahal. Afternoon visit Agra Fort and Sikandra. Evening drive to Delhi & reach Delhi late evening. Rs 7500 for 1-3 persons. Rs 9750 for 4-5 persons. Day 1 Delhi - Agra : Early morning Drive to Agra (by road approx 4 Hrs), reach Agra in the afternoon, Lunch at the hotel and afternoon tour of Taj Mahal, Agra Fort and Sikandra. Overnight at Agra hotel. Day 2 Agra - Delhi : After breakfast visit Fatehpur Sikri, Afternoon drive to Delhi & reach Delhi late evening. For 2 Persons : Rs 7250 Per Person on Double/Twin sharing Room. For 4 Persons : Rs 5750 Per Person on Double/Twin sharing Room. For 6 Persons : Rs 4750 Per Person on Double/Twin sharing Room. For 4 Persons : Rs 4850 Per Person on Double/Twin sharing Room. For 6 Persons : Rs 4250 Per Person on Double/Twin sharing Room. Day 1 Delhi - Agra : Early morning Drive to Agra (by road approx 4 Hrs), reach Agra in the afternoon, Afternoon tour of Taj Mahal, Agra Fort and Sikandra. Overnight at Agra hotel. Day 2 Agra - Jaipur : After breakfast drive for Jaipur enroute visit Fatehpur Sikri. Reach Jaipur late Afternoon. Visit of City Palace, Hawa Mahal and colourful Jaipur Bazar. Overnight at Jaipur hotel. Day 3 Jaipur - Delhi : After breakfast visit Amber Fort with Elephant ride. Afternoon drive to Delhi & reach Delhi late evening. Rs 13250 Per Person on Double/Twin sharing Room for Minimum 2 Persons. - Accommodation as per the itinerary.